We often get caught in thinking about the right and wrong ways of using tools like presentations, blogs, Twitter, and what not. Sure, it helps to know what mistakes to avoid - death by PowerPoint anyone? - but that doesn’t mean you have to limit yourself to the “10 rules of [insert sticky title]”. A great example: meet Travis Isaacs, user experience designer. He uses Keynote, a presentation software, to create wireframe prototypes for websites. Wait, what? That’s certainly not in any rulebook or manual, but it sure works. And Travis even figured out how to turn his approach into a product (more about that on Mashable: Essential Web Design Advice From a Wireframing Master). 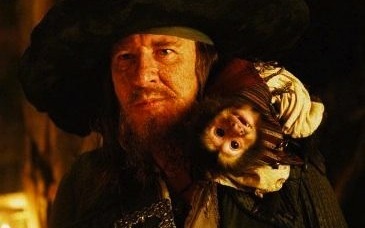 Barbossa: First, your return to shore was not part of our negotiations nor our agreement, so I ‘must’ do nothing. And secondly, you must be a pirate for the Pirate’s Code to apply, and you’re not. And thirdly, the code is more what you call “guidelines” than actual rules. Welcome aboard the Black Pearl, Miss Turner! So, the next time you discover a fancy list of rules for using this and that, think about whether the rules apply to you (are you a pirate or are you a ninja?) and whether it would be helpful to improvise and invent new rules. Think of the usual ways of using a tool as guidelines, not rules. Sometimes a little hack goes a long way!